Although it's getting late in the evening but I've still got a full stomach from eating so many pancakes! We don't have them very often, but they are lovely, I ate three and a half and was quite surprised when my eldest wasn't far behind me, put away two and a half and asked for more! Not a pancake! Soft and fluffy steamed buns with beef in hoisin sauce inside. I was also really impressed with myself for the tea we ate. 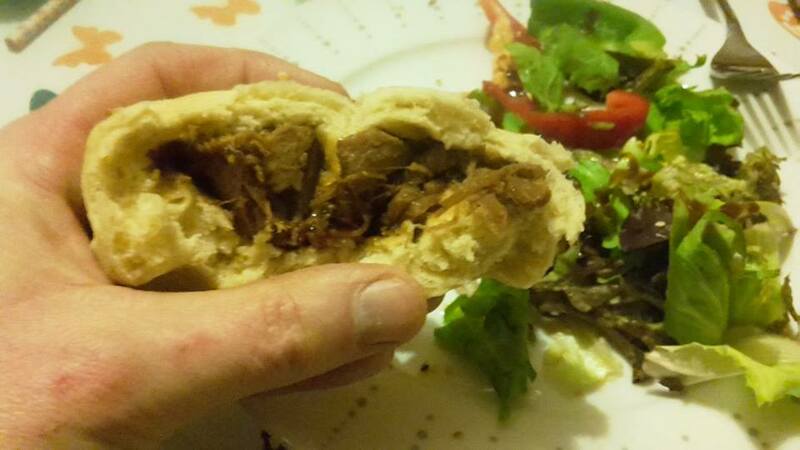 I did steamed Dim Sum beef buns (using some slow cooked beef from the other day) with Hoisin sauce and a salad. I'm going to blow my own trumpet here and say that they were amazing! It's a Jamie Oliver recipe (his is pork though) that can be found here - give it a go, makes an incredible meal! Back to the pancakes though - what do you have on yours? I like sugar and lemon on mine, but golden syrup does just win it for me! I love pancakes! They are the best. They are, but like I said it's just too much effort! So funny you mention this. I make pancakes from scratch a couple of times a week,the little guy loves them and I can feed us all on one egg and some flour. I add frozen berries to the batter and top them with maple syrup or maybe cooked down bananas. We always see it on American TV with the mom (mum to us) cooking loads of pancakes for breakfast, must take ages every morning! I haven't eaten one for years, but it was always sugar and lemon! We had 6 pancakes each (oat gluten free home made) but nothing else. Dumplings look great. Our was a heavy meal with the dumplings as well! We had ours with maple syrup, ice cream and whipped cream last night - full indulgence! Now that sounds good! we used to have ours with ice cream and cherry pie filling! I don't like pancakes, but we have a lot of pancake mix in the pantry, and 4 big nitrogen flushed pails of it in the lower storeroom. That's because my two grown kids like pancakes, so my wife wants to be sure we have plenty in store , should events dictate that they come back here to live with us if things go out of kilter. That burrito looking thing you made was so savory I am going to knock off and go make lunch now! That sounds like a lot of pancakes stored up right there! You should try the dumplings, they're so good and not difficult to make! Oh children are my worst nightmare on pancake day. I stood in the kitchen cooking them and as fast as I made them they were eating them. Gone are the days of scoffing hundreds of them myself. Sugar and lemon all the way here, I feel a bit offended that any other pancake toppings even exist. Yeah the girls just kept knocking them back, I swear they would have eaten double if we'd have let them! Nutella is a good topping, you should let them try that as well!